Helsingissä: Kustannusos Akeyhtiö Otava, 1991. This is the first Finnish edition of Tony Hillerman's The Dark Wind, which is the fifth book in his Navajo Mystery series featuring Jim Chee. 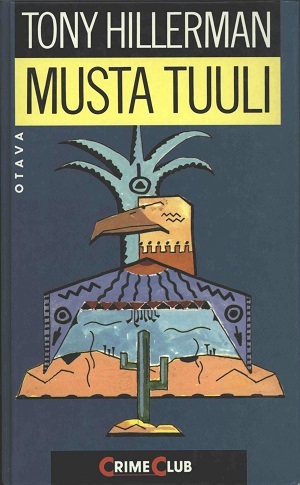 This 1991 edition was published by the Finnish publishing house, Otava in Helsinki. It was translated from Tony Hillerman's original text in English to Finnish by Jyri Raivio. The cover design was not credited. The cover has a pastel geometric style and different elements, including a Saguaro cactus, form the body of an eagle over a desert. Format: Hardback, 21.5 x 13.5 cm.